Home > Blog > Q&A with Stephanie Parkyn. 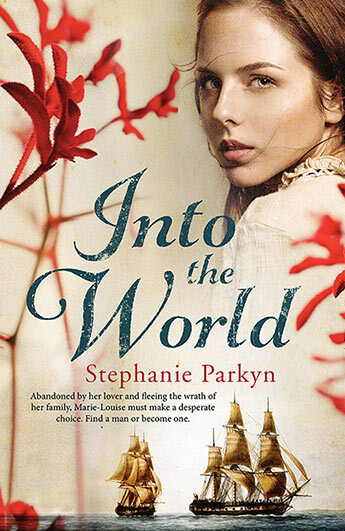 We chatted with Stephanie Parkyn about the publication of her debut novel, Into the World, her writing journey, inspirations and plans for the future. Firstly, congratulations on the publication of your novel Into the World! How has the launch process been? Exciting but daunting! I lived in both Hobart and Launceston while I was writing this novel so I am trying to arrange events in both places to celebrate with friends that have supported me along the way. Have you always been drawn to writing? Yes, I think I began writing stories when I was 8 or 9 perhaps, and I remember gathering my stories together and writing the letter P in the top right hand corner of those I wanted to have published one day! From memory there were lots of earnest stories about animals in dire situations. Have you taken any writing courses throughout your journey? Yes, once I moved to Hobart from New Zealand and found the Tasmanian Writers’ Centre! I began writing fiction by myself without taking any courses while I was still working as a scientist in New Zealand. Finding the TWC was fantastic. I enrolled in Rosie Dub’s Write your Novel course, Gina Mercer’s poetry course and went to practically every workshop from visiting writers in the first few years of living in Hobart. Where did you first hear about Marie-Louise’s story? In Hobart. I think when you first move to a place you are exploring and reading all about it and I kept coming across the story of the French explorers and their visit to Recherche Bay, their positive interaction with the Aboriginal people, and eventually I found out there had been a woman on board the ship disguised as a man. I was immediately intrigued by her story. What had made her take this step? What was the history of those times like when told through her eyes? How did you go about writing her story? Was it quite a linear process, progressing chapter by chapter, or did you write sections as they came into your head? Yes, linear, because I forced myself to tell it that way. I had written a previously unpublished novel in a more scattered fashion, and this time I wanted to do it differently. Also I felt that the story of a journey, a quest of sorts, required a linear progression. I had the words of an A&U publisher from their Faber Academy “Getting Published” course echoing in my head – just tell me a story. So I began by letting Marie-Louise loose on her course and researched as I went. Her backstory suggested itself to me as I learned about the voyage and the history of the French Revolution. You must have had to do a lot of research for this novel? How long did it take to find Marie-Louise’s voice? Probably the whole 7 years that it took to write and edit. I would say I was still working on who she was right up until the end. She always felt quite guarded to me, partly because at the beginning she was a damaged woman, suffering from guilt and loss, and one that needed to hide. I see her as a quiet, but steely heroine with occasional flashes of temper. I made the decision early on to write wholly from her perspective, so any research I found had to be something that she would be there to see. It meant I couldn’t include everything I found interesting, but it was important to me that this was her story. Yes, I think I am a Francophile at heart! I have been to France twice and I went specifically to Versailles (where Marie-Louise grew up as the daughter of a Palace gardener) and parts of Paris to research this novel. It was fantastic to find doorways, floors, walls, and streets that you could actually describe by seeing, touching, listening. But most research came from translated accounts of the expeditioner’s journals or history books. I have been learning French, but I’m not good enough to read the archives! Also I travelled to New Caledonia, a place that the expedition visits twice, and of course Recherche Bay in southern Tasmania. Can you describe your publication process? Did you use a manuscript assessment service before sending it through to Allen and Unwin? No I didn’t have a manuscript assessment. I had several friends generously read it for me, but at that time I hadn’t found the critiquing group that I have now (fantastic Gunnabees!) and I had some conflicting advice about what it needed. Basically, I couldn’t think what further edits I should do, and it had already been 6 years by this time, so I just decided to compile a list of agents and send it out. Truth be told I was starting to wonder if I had made a huge mistake giving up my career and thinking I could ever be published. Miraculously, I had a response the very next day from Gaby Naher agency, she read it, loved it, and I was on her books within a few weeks! I couldn’t believe it. From there I worked with her on it, revised again, and then she sent it out to several publishers in one go. Only Allen & Unwin saw promise. It wasn’t a definite yes, I was given the chance to have an editorial report and they would see how I revised the manuscript after that. How long did you have to wait before they told you your book had been accepted? As you can imagine, once I had the editorial report I took my time to work on the areas that needed improvement. I was hugely grateful for this professional assessment and I spent several months making sure the next draft was as compelling as it could be. I received the report in May 2016 and returned the novel to Allen & Unwin in August. My publisher wanted to take it to an Acquisitions Meeting with the sales team, then I had a short but agonizing wait where I fully convinced myself it wasn’t going to be accepted. And then it was, and I was truly stunned. I have a desk in the attic window of my house looking out over Launceston. I call it my spy window. I feel like writers are already spies, overlooking all their characters, listening to their conversations, dipping into their darkest fears. When I look up from the screen, I have churches, pubs, parks, houses, people and dogs, and all their possible stories to energise me. And I also like writing outside in parks with a notebook and pencil. Kate Grenville, Peter Carey, Emma Donoghue, Anthony Doerr, Heather Rose, Rohan Wilson, Hannah Kent and I have recently discovered Cass Moriarty and Kelly Gardiner. Too many to name really! And I often find myself asking, in life and literature, what would Richard Flanagan do? Do you have plans for more novels in the future? Yes! I fell in love with two of my characters from Into the World, the haughty botanist Labillardière and the amiable gardener, Felix Lahaie, who become embroiled in Josephine’s desire to be the first to germinate Australian plants in her garden in France during a time when she desperately needs to give Napoleon an heir. I am really enjoying branching out into the marriages of all these characters and this time the story is firmly rooted on land!